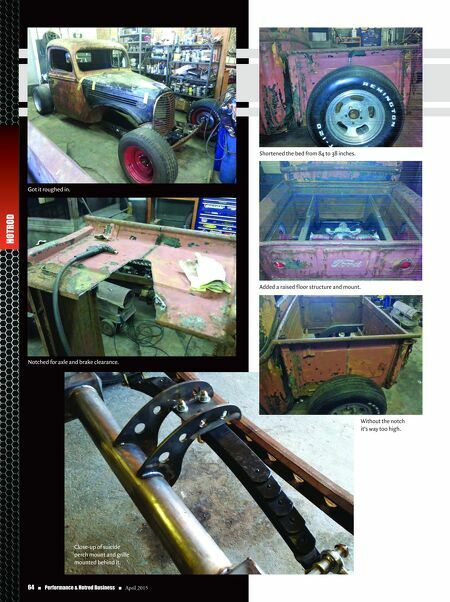 April 2015 n Performance & Hotrod Business n 65 rear rails. The drilled and 4-inch-dropped I-beam disc brake straight axle is on a sui- cide mount. Steering is handled with a reverse Corvair box. We are running a Mustang 8.8 disc brake system, posi carrier, and 3.73-geared rear end. Rear suspension is a ladder bar- style held up with adjustable coilovers and kept in place with a short Panhard or track locator bar. Scott put some neat artsy-fartsy stuff in there, too. A lot of cool drilled holes in plate-style bars. Drilled custom mounts are hold- ing the front spring. The rails themselves also have some 3-inch dimensional holes drilled and tubes welded in that will house some spikes for a meaner look. We have decided right at 4-1/2 inches of ground clearance will get the little truck in and out of parking lots and look killer. What to Cut, What to Keep Scott and I got together with the marker and roll of tape and started lin- ing out what direction we would mount the sheet metal. At first glance it probably looks out of proportion, but once it all started sitting together it was easy to figure out what to cut and what to keep. A huge difference came in the bed. We went from 7 feet down to 38 inches. When we sat it in place, we decided stock mount height just wasn't right. So we plasma'd out a big, old notch and dropped it way down too. The bobber-style truck won't run any kind of fender or running board, but I want to keep the side beauty panels under the hood. That is still a work in progress, but I like the direction so far. The grille shell has been shortened and tucked in behind the spring perch and Scott came up with some cool little hidden mounts. My tastes are pretty simple and plain. There are little details being tucked out of sight all over this build. It's never easy to find the time to work on your own stuff when you run a busy shop, but sometimes you have to bite the bullet and make the time. 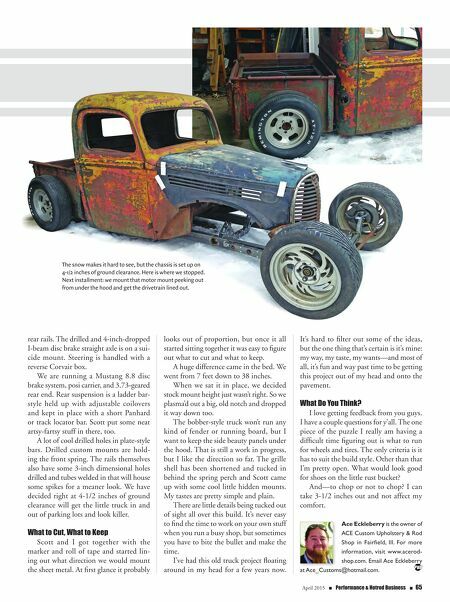 I've had this old truck project floating around in my head for a few years now. It's hard to filter out some of the ideas, but the one thing that's certain is it's mine: my way, my taste, my wants—and most of all, it's fun and way past time to be getting this project out of my head and onto the pavement. What Do You Think? I love getting feedback from you guys. I have a couple questions for y'all. The one piece of the puzzle I really am having a difficult time figuring out is what to run for wheels and tires. The only criteria is it has to suit the build style. Other than that I'm pretty open. What would look good for shoes on the little rust bucket? And—to chop or not to chop? I can take 3-1/2 inches out and not affect my comfort. Ace Eckleberry is the owner of ACE Custom Upholstery & Rod Shop in Fairfield, Ill. For more information, visit www.acerod- shop.com. Email Ace Eckleberry at Ace_Customs@hotmail.com. The snow makes it hard to see, but the chassis is set up on 4-1/2 inches of ground clearance. Here is where we stopped. Next installment: we mount that motor mount peeking out from under the hood and get the drivetrain lined out.